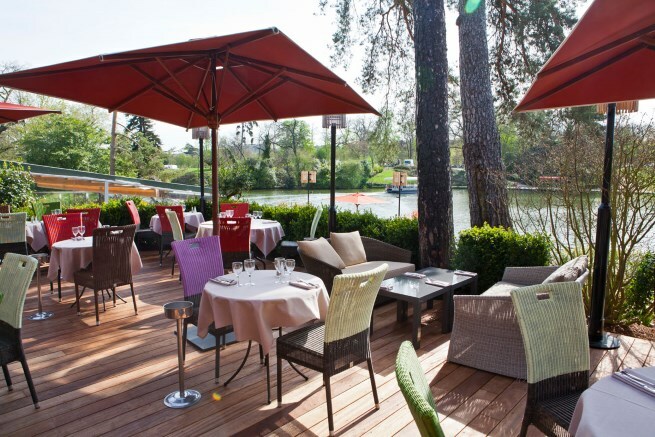 It’s the season for sunning on restaurant terrasses in Paris. 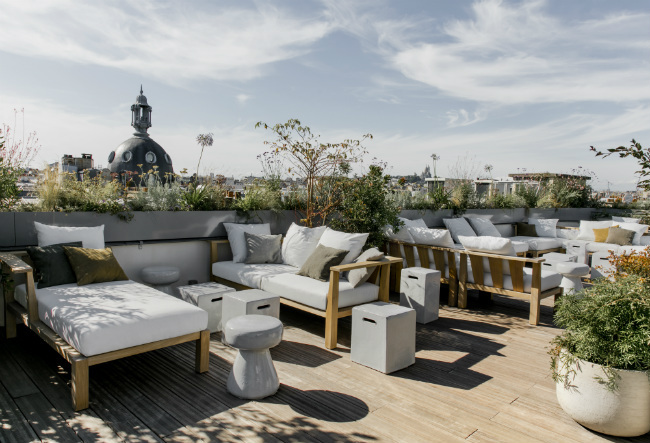 From a rooftop perch to a garden oasis, here’s a selection of favorite addresses in the French capital. Stands for “Maimonides of Brooklyn,” this is a hip and happening hotel concept by philosopher Cyril Aouizerate and his team. Why wouldn’t you come here as often as possible? Located on the edge of the iconic Saint-Ouen Flea Market, the former Electrolux factory is now a hotel/restaurant/terrace – with stunning design by Kristian Gavoille and Valerie Garcia. There’s an outdoor cinema, baby foot, boutique, library– ticking all the boxes for a fabulous stay, either overnight (from €79 even with 5 people in the room!) or to eat, drink and be merry in a unique atmosphere. Check the website for concerts, “le after work” and on Sunday – Brunchez-vous (€30 with drinks – children €15) or order from the food truck– garnish the best pizzas (all organic) in town with herbs from the potager. “Just make yourself at home,” insists Aouizerate. Meanwhile, downstairs, philosophy lectures are broadcast non-stop in the restaurant toilets! If you’re in Lyon, the Philippe Starck designed M.O.B is now open and, if you’re in Pittsburgh, Washington DC and LA Chinatown check them out. “The spirit of Mob Hotel is reflected in the identities of sight, sound, smell, taste and touch. 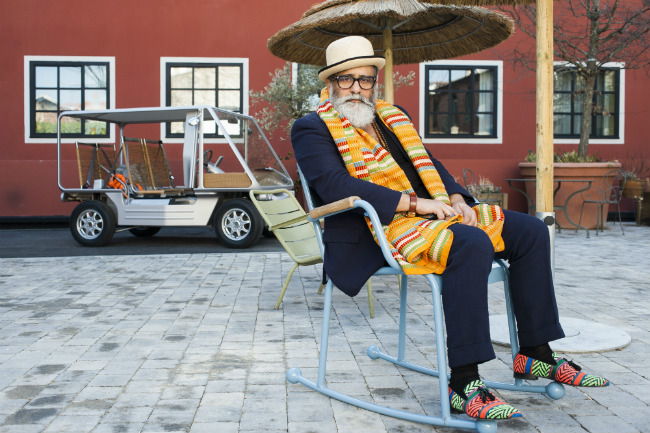 Mob Hotels is a movement, not a marketing concept”, adds the delightful Aouizerate. The Donald would appreciate this splendid contemporary glass and steel structure, perched above the handsome Théâtre des Champs Elysées. The decor’s by Imaad Rahmouni – a disciple of Starck – and the theatre- designed by architect Auguste Perret- celebrated its centennial in 2013. Melania would definitely approve of the elegant Montaigne Terrace with the Eiffel Tower nearby, and the Seine flowing beneath. Not certain if chef Fabrice Giraud sends out hamburgers – but maybe the Trumps would like Jerusalem artichoke soup, studded with black truffles; Black Angus Beef (for him), Carpaccio of wild sea bass (for Melania), followed by pastry chef Paul Donore’s secret recipe chocolate cake. They’ll choose from 380 wine references. Tasting Menu costs €95-€125, Lunch €49-59, and the Gourmet Menu is €72, A La Carte about €104 + wine. 15 avenue Montaigne, 8th. 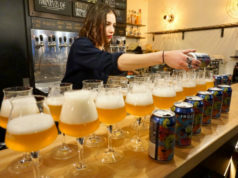 Metro: Alma-Marceau, Tel: +33 (0)1 47 23 55 99. Read the Bonjour Paris review of Maison Blanche here. Website: www.maison-blanche.fr. 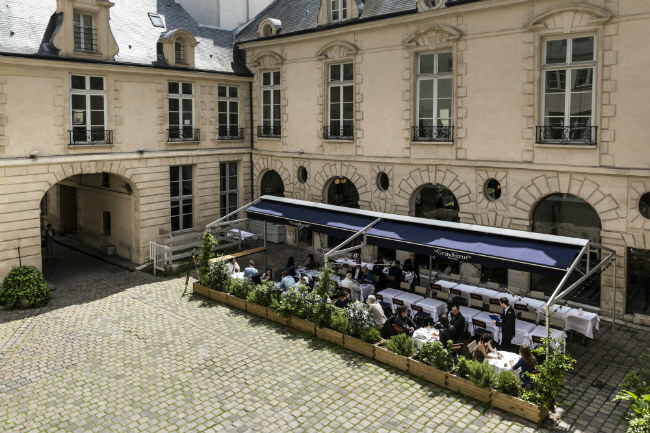 Located opposite the Centre National des Arts & Métiers, the new Hôtel National des Arts & Métiers is strategically located at the crossroads of the Montorgueil and Haut Marais districts. Italian industrial chic décor’s by Raphael Navot throughout the 70, all different, rooms (from €188). Head up on the roof, but book ahead, for an incredible choice of hip and happening cocktails, say, bespoke brands of gin and tonic (€18) and cocktails (from €15-€20) plus popcorn and truffle oil snacks. Open from 17-23hrs. 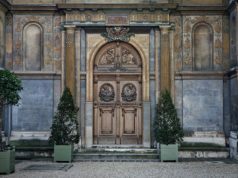 Located on an isle in the Bois de Boulogne, accessed by private ferry in less than two minutes – no passports required – Chalet des Iles was built as a gift from Napoleon III to Empress Eugénie. When it became a restaurant, Proust and Zola were frequent guests. Renovated after a fire in 2011, architects Bruno Borrione and Caroline Lory preserved the Ralph Lauren style hunting lodge vibe. 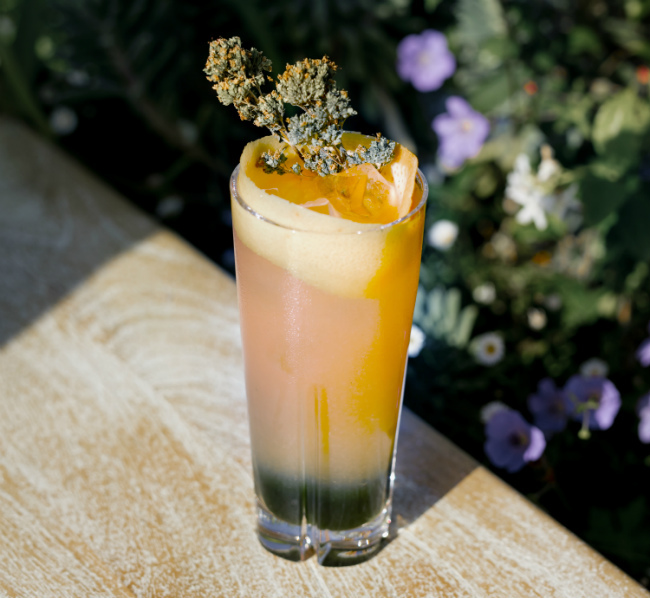 Inside, club atmosphere – outside, airy “toes in the water” attitude, flower and herb terraces wrap themselves around the lake – the perfect Sunday Brunch spot. A space (near the Pompidou Center) showcasing New England Lobster Rolls with a tiny terrace. Yummy toasted brioche sandwiches stuffed with chopped Saint-Malo lobster drizzled with house made mayo or avocado and lime. 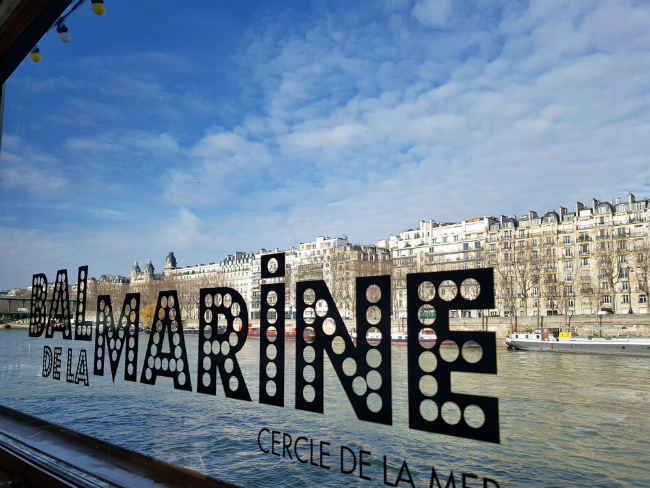 “It’s street food, version palace”, says young talent Moïse Sfez (graduate of Ecole Vatel, Paris who worked with Alain Ducasse at The Dorchester and Le Meurice). Sfez discovered his niche brand while in the USA – when he returned he was a sell-out success at BHV Marais Food Court. Choose Le Classique or Le Connecticut (from €17-€22); sides from €3 include wasabi or truffle chips, wakamé salad – and how about a PBJ (peanut and jelly sandwich €5) while you wait – or for dessert? Drink house lemonade or Bud. Following complete redecoration by Emma Roux, Le Sancerre, Montmartre Village, looks as it did back in the day when artists, actors and painters kept their “rond de serviette” at their favorite table. Watch the world go by from the terrace (open 7/7 from 7h-2h). The menu’s traditional with a modern spin – just like the neo-brasserie. Burratina, tomatoes, aubergine, basil coulis (€9.95) Croustillant de ris de veau à la plancha, shitakes à la crème (€29.5) Excellent wines and cocktails by the in-house mixologist – fresh truffle coquillettes (€17.50) wicked Paris-Brest dessert (or profiteroles, crème brûlée (€8.5) or crepes flambées (€8) Sundays, chef plays the egg man with variations on a theme from 11.30-16.30. 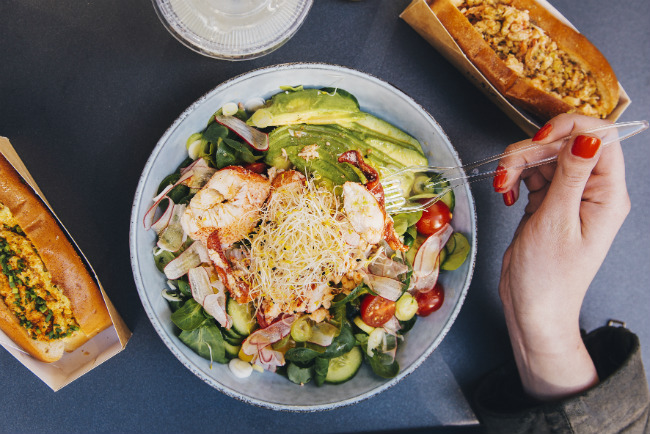 Don’t ignore Croque Monsieur (€14.5) or – for the ladies who lunch – César, prawn and vegetarian salads (€17). You’re gonna love it ! Restaurateurs Julien Fouin and Ludovic Dardenay, the creators of Glou and Jaja, opened the fabulous Grand Coeur in 2015 – the atmospheric neo-brasserie is located in a cobblestone courtyard (shared with the Ecole du Marais dance center– it’s all rough stone walls, blue velvet banquettes, brass rails and it’s buzzing with ze beautiful pipole. 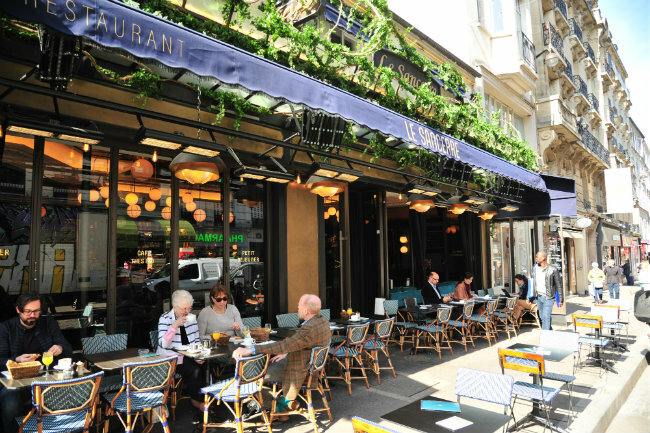 Outside, the table d’hôtes-style listed patio was voted Le Figaro’s top terrace. From the kitchen chef Maura Colagreco (chef/owner of **Le Mirazur in Menton) and Sicilian talent Nino La Spina send out, say, Asparagus tart; Ragoût of baby peas, cockles and squid; Pollock, cucumber, yogurt; Cantal guinea fowl aux morilles mushrooms; Octopus, chickpeas and, to finish, strawberry soup with rhubarb. Lunch (€23-€30) A La Carte about €55 + wine. Watch the sunset in the shadow of the Eiffel Tower almost “toes in the water”. 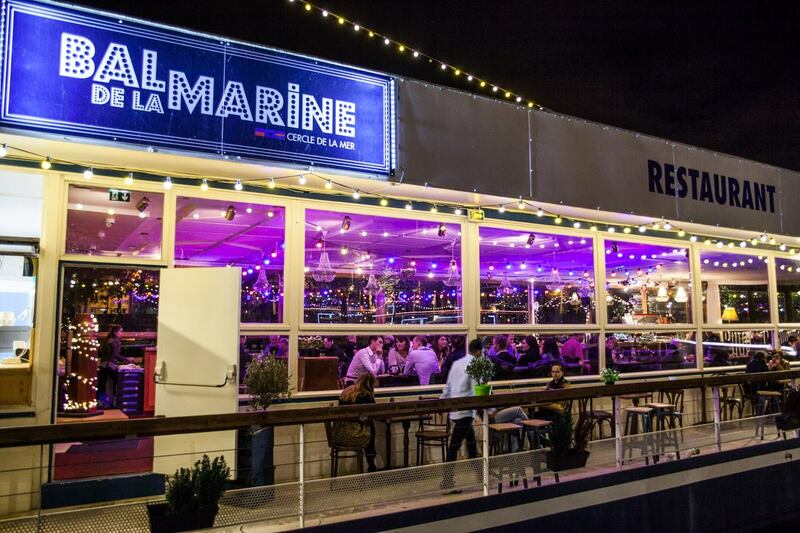 This ephemeral barge/bistro is the perfect warm weather address. 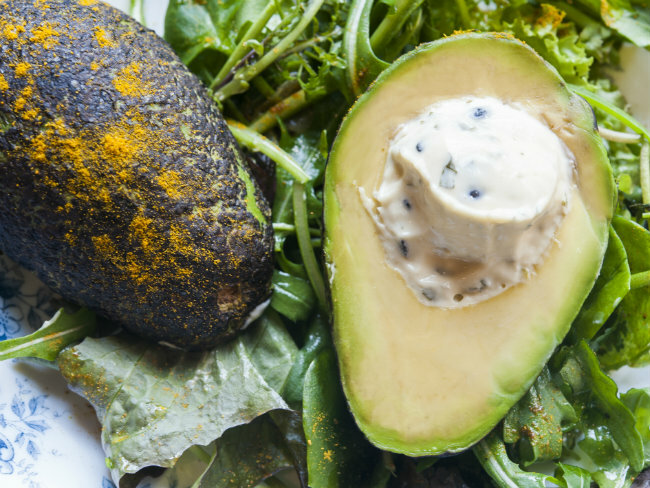 Lunch formula (€28-€33). Dinner and weekends share “Les petites assiettes du bal” from €7-€14 and interesting bio wines in collaboration with Cave Vaneau. Captain/cheffe Charleyne Valet says her dishes are inspired by her grandmother Nita as well as world travels – langoustine pain perdu with almonds; razor clams beetroot and wasabi; catch of the day. Eclectic music and dancing – you’re in a Corto Maltese setting – in the heart of Paris. And, stay tuned for details of the Zebra Square reboot of the brasserie/bar/terrace by Alexandre Giesbert and Julien Ross – hereafter known as: Zebra – 3 place Clément Ader, 16th.